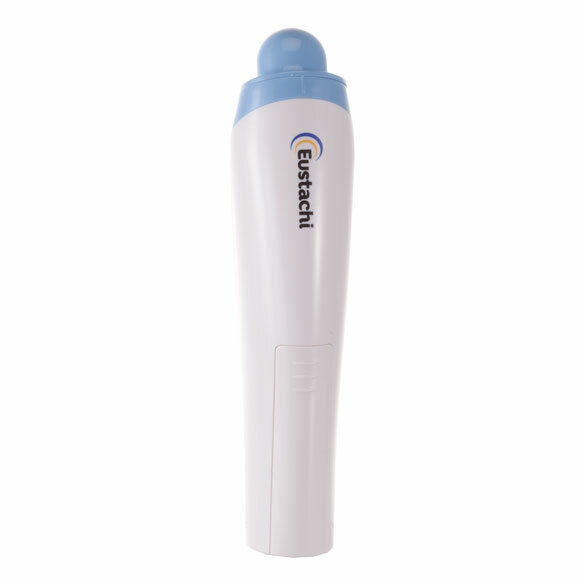 An easy solution to plugged ears, Eustachi Eustachian tube exerciser opens them instantly and helps keep the Eustachian tube system working as it should. 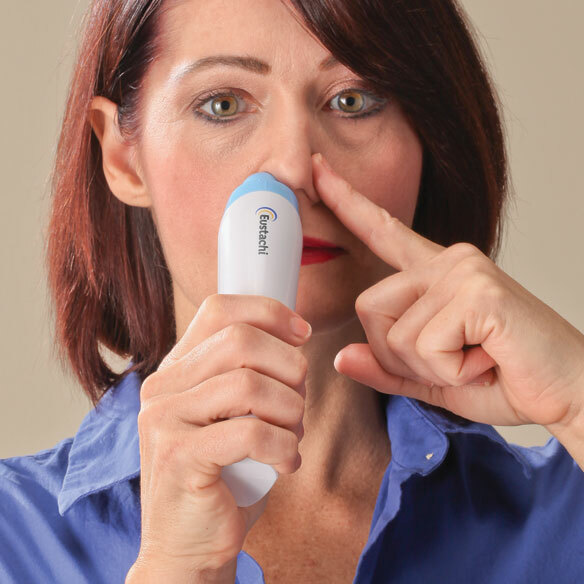 Simply hold this ear popper device against nostril to form a seal, plug other nostril and push button to start airflow. 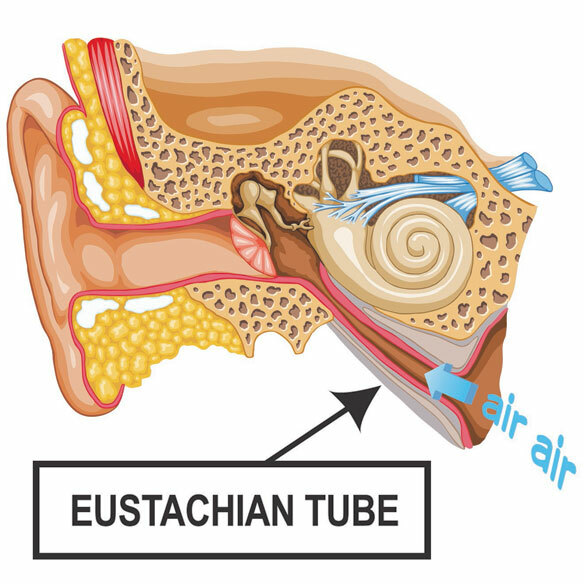 Then exercise Eustachian tubes by swallowing air or taking a sip of water or other beverage, which will clear the ear. Safe for anyone to use, even caregivers of those who can swallow on command. All-natural ear pressure relief tool requires no medications. More effective than yawning, chewing, or pinching ears and blowing. Includes 8" x 5" plastic carrying case and instruction manual. Requires 2 AA alkaline batteries (not included). 6" x 2" x 1"; weighs 0.4 lbs. Clean with an alcohol wipe as needed. After 6 weeks of having plugged ears I was very reluctant that something like this could ever work. At first it did not but I tried 3 more times throughout the day. The next morning I tried it again and an hour later I heard this strange clicking in my ear and I felt it starting to open...however within a couple hours they both plugged back up. The third day was the charm and both ears are totally open so I just cancelled my ENT visit. It works but it may take a few days. They don't really say that in the instructions. I was under the impression it would just take one time. The product worked just like they advertised. My ears were plugged up for the last 5 days after driving between Orange County and Palm Desert so I decided to give it a try. Worked right way. I'll bring it with me everywhere. I ordered this for my husband. He uses this all the time. He says it really helps his ears unstop. I choose this item because I have hope it will help me. Because my ears were constantly plugging up and to the point at times that it would give me a headache. My ears plug up after dialysis every time I have it done, which is 3 days a week. Have looked for something to help for a long time. When I seen this in your magazine I wanted to give it a try. Have had blocked eustation tubes for 15 days and found this and hoping it works. Recently diagnosed with Menieres disease. Want to see if this helps. My mom has a huge problem with her ears closing up with weather changes and I want to try and help that. Here's hoping! I have a plugged ear from flying and this product seems to make sense for my problem. May I return this item if it will not work for me ? BEST ANSWER: Thank you for your question. This is returnable within our 45 day return policy. We hope this information will be of help to you. does eustachian tube liquid work? BEST ANSWER: Thank you for your question. According to the reviews posted the Tube Exerciser works well. We hope this information will be of help to you. I have mucus filled E tubes, will this work? BEST ANSWER: Thank you for your question. Yes this should work well for you. We hope this information will be of help to you.